Day 325 – On The Moooooove! So you may remember that a bit ago, Abby decided that the cows were very cold out in the snow and she needed to get them inside. Since the snow has melted and it’s warmed up outside, and since we really needed to be able to use our bathroom again, I decided to get the cows out of the house. The little cow was easy to pull out, but the mama cow… That was some WORK. Remember how I said Emerald gave me a cow so I could make steaks? Yeah, um, I haven’t made steaks yet. And now the cow is just all laying there with flies around it. Excuse the crappy pic editing tonight. I was using Pic Monkey because I’m SO SLEEPY and didn’t feel like even opening photoshop. Emerald gave me a cow! I should name it dinner because I plan on making it into steaks. LOL The funny part is that she gave me this cow a couple of days ago and I didn’t realize you had to “Birth” it to make it a cow. It just sat outside the house for a couple of days not doing anything until Aldwyn asked me tonight if it’s going to grow or something. 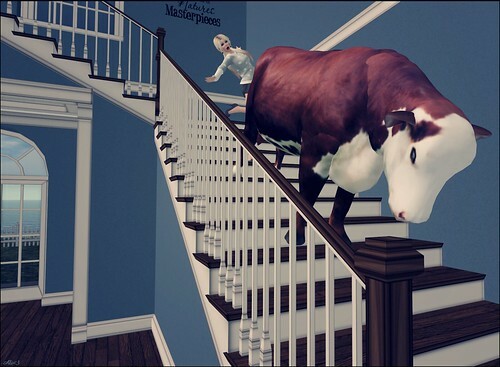 I’m a bad cow mom.